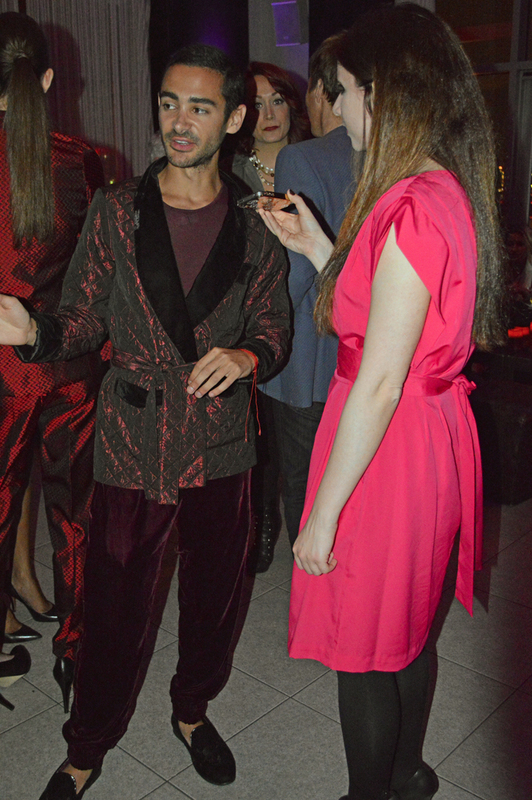 Designer Adrien Field held a private presentation of his AUGUST FIELD Fall/Winter 2013 collection titled ‘Maharaja’s dream’ at the Gansevoort Hotel Rooftop. The new AUGUST FIELD collection is one that needs be felt and experienced as much as it is to be seen. Combining rich Eastern fabrics such as silk brocade, microfiber velvet and satin with classic Western tailoring, the line envelops the wearer in a cocoon of luxury. The Gansevoort embodies such a decadent dream like setting which set the perfect tone for Adrien’s luxurious collection. As expected I arrived to a glamorous event filled with champagne, hors d'oeuvres, fabulously dressed guests and an unbelievable view of the city. It truly felt like a dream setting as I spotted designer Adrien Field holding his adorable dog and chatting about his new collection. 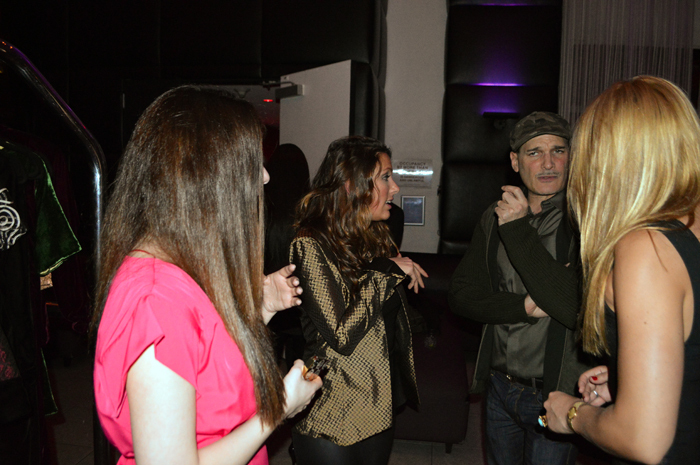 I had a chance to meet Adrien later in the evening for an exclusive interview about his new Fall/Winter 2013 collection. Can you tell me about your new collection? Adrien Field: The collection is very much inspired by my world travels specifically within India. I lived in New York for 5 years and started out as a fashion writer. I’ve written for VOGUE ITALIA. I was the Fashion Market Editor for VIBE magazine. I was also a celebrity stylist working on a lot of Nicki Minaj’s biggest and earliest videos. I was very bored of life in New York. I gave up the lease on my apartment and sold all my possessions. I packed two suitcases and I left for India where I stayed for two months. I became so inspired by the richness of life and the fabric there. I went to a small tailor shop. I was in love specifically with brocade fabric which is a woven silk. I made three pairs of brocade pants just for myself to wear. When I came back to New York after two months in India I was a guest at New York Fashion Week. CNN stopped me on my way to Lincoln Center and they were obsessed with my pants and wanted to talk to me about them! When I moved to LA shortly thereafter I began to slowly build my business. I had a great contact in India in the factory. I did my first very small capsule collection of unisex brocade pants, a few satin tops, a few jackets. I got press representation in Beverly Hills. We've been on Carmen Electra, shown on Robin Wright and a lot of both national and international magazines. I used that leverage to bring investors to bring up the company in a proper way. I went back to India in November-December to design this new full Fall/Winter 2013 collection. I’m inspired by the chic, hedonistic woman who doesn't think twice about bringing funyons and Veuve Cliquot on a private jet ride. She’s fabulous and lives in her own world of total chicness and fun. The collection reflects that. What kind of materials did you focus on? Adrien Field: All of my materials are from India. I used silk brocade which is a woven silk, micro-fiber velvet lined in satin. It’s all about classic tailoring so the pieces look good now and will still look good in 20 years. One of my favorite pieces this season is the bomber jacket. Where are you selling the collection right now? Adrien Field: We’re launching e-commerce on augustfield.com on April 1st with my Spring collection. Then we’re launching for national wholesale for Fall 2013 to be in stores for September 2013. After my interview with Adrien I met Celebrity Stylist Phillip Bloch. We were both quite enamored with the new AUGUST FIELD Fall 2013 collection! 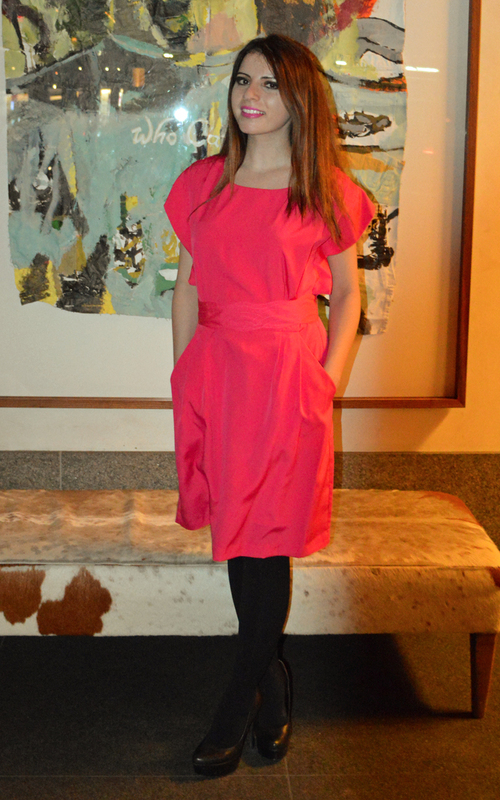 The perfect ending to my evening was spent being photographed around the Gansevoort Hotel in my favorite pink Drape Sleeve Sash Belt Dress by Eliza J. I loved everything about this dress, especially the fact that it had pockets!